Kobe Bryant, one of the greatest professional basketball players of all time retired last week at the age of 37. He played all of his 20 seasons with the Los Angeles Lakers. Kobe Bryant is an 18 time NBA All-Star and a 5 time NBA champion. He was a beast on the court, so naturally he got paid pretty well during his career. 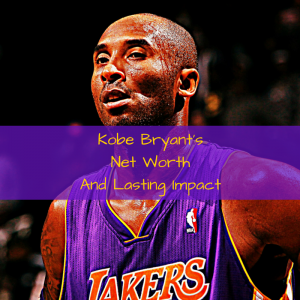 Bryant has earned $323 million in salary from the Lakers over the course of his career. This season alone he made $25 million! Besides his salary, he has also made over $280 million from endorsement deals. Some of those deals are listed below. Kobe Bryant has been signed to Nike since 2003. His first deal was worth over $4o million for 4 years. He signed his most recent deal, a five-year contract in 2014. Kobe’s Nike shoes are the third best-selling signature shoe behind Lebron James and Kevin Durant. Kobe signed a $10 million deal with McDonald’s in 2001. Kobe made millions with Sprite from 1997-2005. He starred in several popular commercials for the company. In 2013, the phone company Lenovo tapped Kobe to sponsor an Android phone called the Lenovo K900. Kobe Bryant signed with Adidas straight out of high school in 1996. He stayed with them until the summer of 2002. The contract was worth $48 million. The next company that Bryant endorsed was Hublot. Hublot is a Swiss watch brand that sells luxury watches. Their watches sell for an average of $20,000 – $30,000. In 2011, Kobe signed a three-year deal with Mercedes-Benz. He helped promote the Smart Microcar to people in China. Kobe Bryant signed a deal with Turkish Airlines in 2010. He has been featured in several commercials and print advertisement. Now that his playing career is over you may think Kobe will just enjoy retirement by playing golf and hitting the beach. Wrong, Kobe already has his hands in a few business opportunities. In 2013, while injured, Kobe started a company called Kobe Inc. Kobe Inc. was created to grow brands that challenge and redefine the sports industry. Kobe has also invested in the sports drink BODYARMOR. BODYARMOR has coconut water in it. It also claims to deliver more potassium to an athlete’s body while offering less sodium. Kobe is also the third largest shareholder behind the founders of the company. Kobe Bryant has also invested in The Players Tribune, which is an athlete driven website founded by New York Yankees great Derek Jeter. As you can see Kobe Bryant has made a lot of money from playing with the Los Angeles Lakers and through his numerous endorsements. His skills have allowed him to be a very marketable player over the years. Now that he is retired he plans to grow his net worth of $320 million even higher. The business ventures that I mentioned earlier are probably just the beginning for Kobe. It will be interesting to see how everything plays out. Do you think Kobe Bryant has what it takes to be the next Magic Johnson? Did any of his endorsement deals surprise you?